Why hasn’t TOMS Shoes changed? A few weeks ago, I posted a (rather harsh) article on my Facebook wall about “the worst” international aid ideas. It sparked a lively debate among my friends about good intentions vs. bad ideas in aid, preventing and discouraging failure, and social good business models. I want everyone to always be thinking about how to make the world a better place. So it’s great when someone comes up with a new social good initiative. But when you explore that idea, or maybe even pilot it, and learn that your idea isn’t having the kind of impact you were hoping for, it’s time to rethink the concept and pivot. As Sasha Dichter of Acumen Fund explains, the social sector should learn from Eric Ries–The Lean Startup author–and create a Build-Measure-Learn cycle to identify failures and pivot. My main criticism of TOMS and organizations like TOMS, beyond the negative consequences of their business model, is that after all of the public criticisms of TOMS, it has made no effort to change or pivot. TOMS could be more transparent about its opaque supply chain or even move its operations to local communities, or shift its model away from giving shoes for free to using profits to support local jobs, training, or schools. 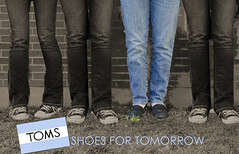 TOMS has a strong brand name with a large customer base. Imagine if they used their name recognition and community to raise awareness and serve as an example for how similar organizations can also improve. Ultimately, TOMS is not an example of bad aid for its faults, but because it hasn’t attempted to change its ways. Public criticism of social good organizations like TOMS aren’t discouraging social entrepreneurship or preventing people from trying a risky new approach to make the world a better place; rather, it’s encouraging more thoughtful, intentional aid initiatives that revisit their model when they aren’t achieving impact or are potentially doing more harm than good. I really enjoyed the debate on my Facebook wall and I believe this is a very important discussion that needs a lot of voices and opinions involved, so feel free to share your thoughts here!